The Telegraph called mosquitoes “far and away the deadliest animals on earth.” Science backs up the hyperbole. According to World Health Organization (WHO) estimates, mosquito-borne diseases kill some 725,000 people a year. Malaria alone accounts for 600,000 of that number. The next most deadly animals are humans themselves, responsible for 425,000 deaths a year. By comparison, snakes, dogs, crocodiles, hippopotamuses, lions, wolves and sharks combine for a meager-by-comparison 75,000 deaths. Sharks — notoriously feared — only account for 10. Part of a mosquito’s arsenal is ubiquity: They can be found in nearly every part of the world at some time during the year and, according to Smithsonian Magazine, at peak breeding season they outnumber every animal on Earth save ants and termites. Another factor is that they’re small enough to go unseen until the damage is done. Here’s a list of the deadly diseases that can result from a mosquito’s bloodsucking bite. Other than times of large-scale war, mosquitoes top the deadliest animal list every year. Among the illnesses these tiny menaces carry, malaria is particularly malicious and widespread; 200 million people are infected with malaria annually. Half the world’s population lives in areas that make them potential targets of opportunity for the malaria-carrying Anopheles mosquito looking for a blood meal — and infecting their food source along the way. From the Italian for “bad air,” malaria has been known about for 4,000 years. Famed early doctor Hippocrates noted its symptoms in fourth century Greece. It is thought to be responsible for the decline of the populations of many of the Greek city-states and the Roman Empire. Symptoms include high fevers, shaking chills, and flu-like illness. And unlike other mosquito-borne diseases, humans are part of the infection process. 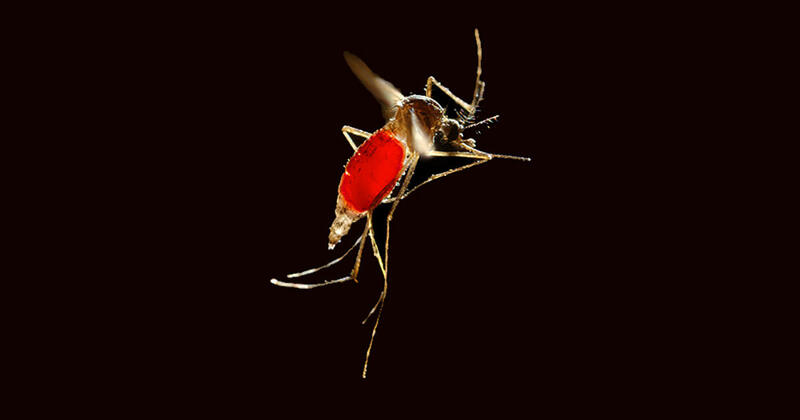 Malaria parasites grow and multiply first in the liver cells and then in the red blood cells, getting picked up by a feeding female mosquito, which then passes it on to yet another human. About 70 to 80 percent of people infected with West Nile virus don’t develop any symptoms at all. Those who do get sick mostly develop a fever with other symptoms such as headache, body aches, joint pains, vomiting, diarrhea or rash — and then get better. That doesn’t mean it can’t be deadly: The biggest risk is that the West Nile virus can cause severe encephalitis, or inflammation of the brain, which occurs in less than one percent of patients. About ten percent of those people die. Multiple species of mosquitoes, including several from the Anopheles, Aedes, Culiseta, and Culex genuses each, are known to carry West Nile. Primarily found in the tropics, where it is a leading cause of death, according to the CDC, there are an estimated 400 million dengue infections each year in over 125 countries and 40 percent of the world’s population live in dengue-risk areas. Its most severe form, dengue hemorrhagic fever, causes blood vessels to leak, which leads to bleeding from the nose, mouth and gums. If not treated, the blood vessels can collapse. Endemic in more than 100 countries in Africa, the Americas, the Eastern Mediterranean, Southeast Asia and the Western Pacific, there are around 500,000 annual cases of this most deadly kind of dengue infection every year. Aedes aegypti, the species of mosquito that carries dengue — as well as chikungunya, yellow fever and Zika — have been likened by ecologists who study insect-transmitted disease, such as Emory University’s Gonzalo Vazquez-Prokopec, to “the roaches” of the mosquito world, adapted to living with humans and adept in urban environments. More than that, while the mosquitoes that carry malaria are strictly evening feeders, Aedes aegypti bites during the daytime too, making them much harder to defend against. Chikungunya virus is primarily found in Africa, the Indian subcontinent and Asia. But in 2013, the Western Hemisphere had its first local outbreak when an epidemic swept through the Caribbean and cases soared to one million. Since, it’s been identified in 45 countries or territories in the Americas with more than 1.7 million suspected cases reported. Because it shares symptoms with dengue, such as fever, severe joint pain, muscle pain, headache, nausea, fatigue and rash, chikungunya is often misdiagnosed as dengue. Like Zika and dengue, it can also result in neurologic diseases such as Guillain-Barré syndrome, meningoencephalitis and cranial nerve palsies. The virus has also been associated with rheumatic disorders including rheumatoid arthritis — giving rise to its Swahili name that translates to “illness of the bended walker” — and rare complications, including heart inflammation, acute renal disease and severe bulbous lesions. Yellow fever is a rare tropical illness characterized by fever, muscle pain, headache, nausea and vomiting — and, in rare cases, jaundice and bleeding from the mouth, nose, eyes and stomach. On the bright side, a vaccine is available, stemming occurrences in 99 percent of the people who take it. Still, it takes down 30,000 people each year. Zika is the marquee mosquito disease of the moment, infamous because of recent outbreaks concentrated in South American countries like Brazil, home to the 2016 Summer Olympics, and that just this summer entered the United States in Florida. Though transmitted by the same mosquito, Zika virus carries less severe symptoms than a dengue infection, including rash, joint pain, inflammation of the eyes and fever. But as many as 80 percent of infected people may be asymptomatic. Found for the first time in the Western Hemisphere in 2015, since this outbreak began, an estimated 500,000 to 1.5 million people have been infected. Though the Zika virus doesn’t kill, it can cause a birth defect known as microcephaly, a condition that causes babies to be born with dangerously small heads and brain defects. Particularly troubling, Zika introduced a new twist to mosquito-borne diseases outside of direct bites: It can be sexually transmitted.